Looking to have fun and be adventurous! Want to connect with Cidalia? My name is Cidalia, but everyone calls me Cid for short. I come from a large family that I spend a lot of time with. I have been able to take care of my 5 cousins throughout my life, as well as my 3 nieces and 2 nephews. It has been 9 years and counting that I have watched over the young ones and I enjoy it very much. I have my first aid and level hcp cpr, as well as my own transportation. I love to play all kinds of sports, especially baseball and volleyball. I am currently coaching baseball along side my dad for the Cambridge Girls Softball Association. It is a great experience to watch the girls grow and develop new skills. I am very outgoing and adventurous. I have my own dog that I love to play with and take for walks, so I like to be outdoors. I like to have fun and spend my days doing something productive. I always put others first and I care for people very much. I would care for your children just like I would care for my own family. 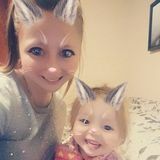 Excellent Nanny Looking for Full Time Summer Job! Part-Time or Full-Time Nanny Available Beginning in July!